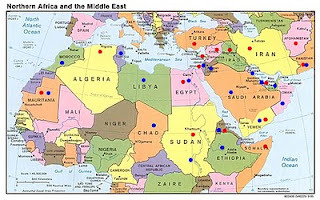 In 2007 I had a post concerning the strategic makeup of the Arab world and the Middle East. Click here to see the map with the dots. 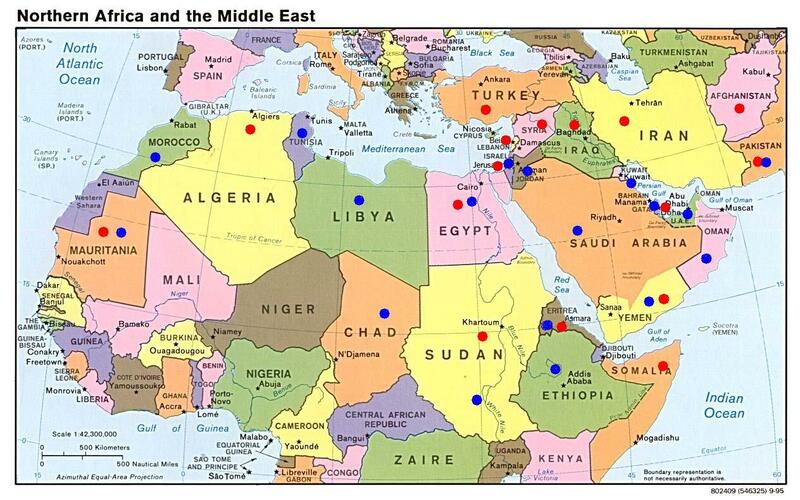 At the time there were some interesting observations, countries with blue were firmly within the American/European/Israeli orbit, countries with the red dots were in the Eastern/Islamic/Pan Arab orbit. Some countries had both dots, like Iraq, and it was clear that there was a conflict in those countries. Fast forward three years and we find some surprising changes to the strategic makeup. We start from the lands of the Maghreb, where we find that Mauritania's position regarding Israeli occupation has led to extremely loud and principled positions. This has been more than just popular protesting and has creeped into officially firm stances in some instances. This gives Mauritania a red dot whereas in 2007 it had a blue one. Algeria's firm stance supporting the Palestinians, the presence of Algerian MP's on the "Freedom Flotilla" and Algeria's increasing involvement and voice in Arab and Islamic issues following a long period of isolation and civil strife marks its gradual return to the Arab/Islamic orbit. Algeria is a firm red dot where in 2007 it had a blue dot. Egypt and Sudan are both countries on the verge of major changes. Sudan is earmarked for dissection by the Western powers through its oil rich south. This is the result of a steady and unending campaign that began with the sham "Darfur" circus ignited shortly after 2003 to deflect attention from the American occupation of Iraq. Egypt is awaiting the imminent death or abdication of President Husni Mubarak, it is unknown who will take power after him, but Egypt's position is near exploding point and therefore it is far from certain that Egyptian officaldom will remain firmly in the Western orbit. Therefore Maysaloon gives Egypt both red and blue dots. Israel is, of course, a blue dot, but the rise in Hamas' importance means that a red dot has emerged where in 2007 the area was firmly covered in blue dots. In Eritrea, the presence of both Israeli and Iranian or Hezbullah operatives in the region make it a disputed hotzone, it could go either way and is currently an intelligence playground. Somalia is now firmly a red dot, the rise of piracy, withdrawal of the Ethiopian army and renewed strength of Islamic groups has given the country a red dot. In 2007 it had a blue one. Yemen too, the uprising of the Houthis (backed by Iran) gave the Saudi and Yemeni government much to worry about. Increasing Iranian naval influence off the Yemeni coast and the increasing strength of Islamic groups there all give Yemen a firm red dot. In Qatar there are two dots, red and blue. Qatar is playing a key role between the two sides and is a key partner of Iran, Syria and, now Turkey. Lebanon is now firmly a red dot. Turkey is the surprise change of 2010, from a firm blue dot in 2007. Erdogan's government has made increased moves eastwards and appears to have made a strategic choice to strengthen ties in the long term with her Eastern and southern neighbours. The future is still uncertain, but for 2010, the red dot is now, surprisingly, strong in Turkey. In 2007, there were two dots, one red and one blue to highlight the resistance movements in Iraq to the American occupation. The American conceding of Iraq to Iran, whilst a blow to Arab and Sunni nationalists, marks Iraq as firmly within the red orbit in spite of the existence, for now, of American troops in the country. This is unlikely to last much longer as the United States prepares to leave by setting up a miniature army to protect its embassy and interests there, but with the expectation by Maysaloon that American military presence will be scaled back quietly over the next five years. Additions to the map are Afghanistan and Pakistan. Afghanistan is now firmly with a red dot, the Taliban are poised to overrun the country as soon as the Americans, who are unable to control the countryside, leave. Rumours are that President Hamid Karzai might be negotiating with the Taliban. Pakistan is in dispute, the assassination of Benazir Bhutto put any hopes of a firm blue dot in Pakistan in severe doubt. Pakistan has many problems but because the West has been unable to consolidate a firm grip on the country through a strong central government, something lacking at the moment, Pakistan today deserves both a red and a blue dot. The firm post 9-11 alliance with America is on extremely shaky grounds, whatever remnant of it still exists. That's an interesting map : thank you, Maysaloon. About the blue dots countries, I'm pretty sure though that if these countries were not ruled by collaborationist smurfs, they would not support the occupation of Palestine! According to the inhumane practices and impunity of the Zionist State, people of goodwill could only see red. I agree, you are very right. The dots are there for the "official" position of the countries, which unfortunately is what is causing the damage! Other than that I agree with you of course. u two should get married.. wink wink..